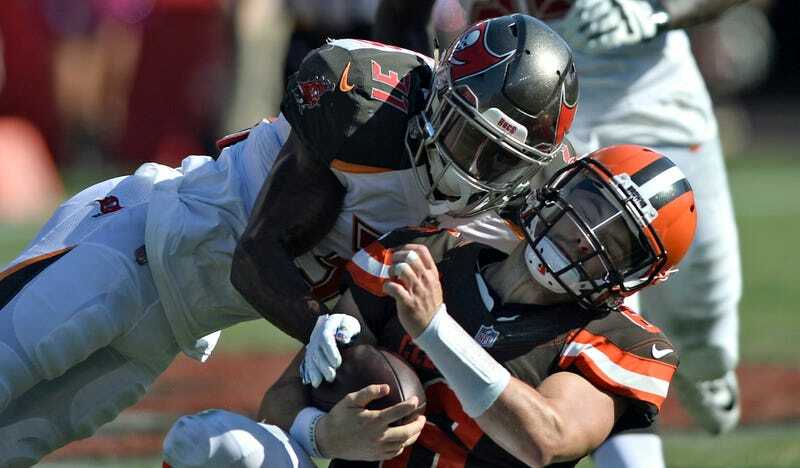 In the fourth quarter of last weekend’s game against the Buccaneers, Browns QB Baker Mayfield ripped off a 35-yard run. As he began to slide to the turf, Bucs safety Jordan Whitehead zipped to the ball and laid him out with a flying helmet-to-helmet hit. Officials threw a flag for unnecessary roughness, but after a short conference, lead referee Shawn Hochuli picked it up because he decided Mayfield was technically an unprotected runner at the time of the hit. As it turns out, the NFL agrees with Mayfield. NFL head of officiating Al Riveron highlighted the play in his weekly officiating recap video today, and he said the flag was incorrectly picked up. According to Riveron, the play should have drawn a flag because Whitehead lowered his head to make contact and because Mayfield had begun to slide. He begins to discuss the play 51 seconds into the video.